What has Jughead gotten himself into this time? It's a complicated romantic entanglement with Sabrina that goes about as well as you'd expect. Not well at all. Dating isn't Jughead's strong suit but magic is Sabrina's forte and the consequences of that disaster of a date lead to some funny retribution. 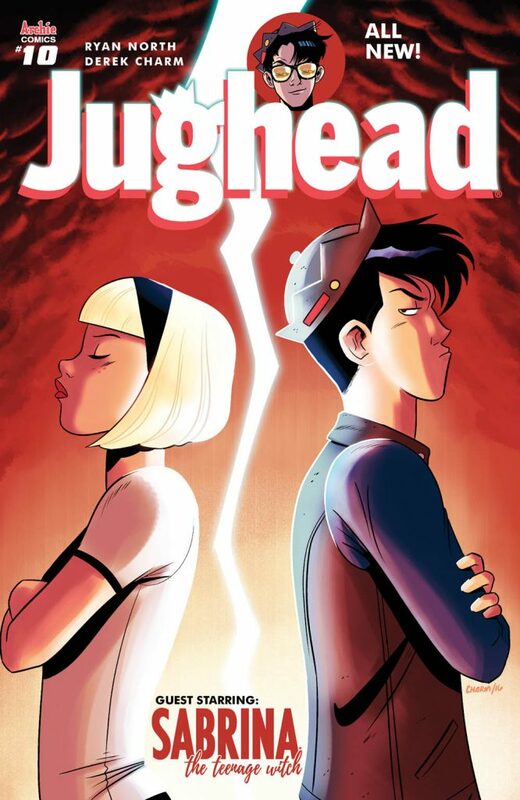 Jughead #10 takes slapstick and awkwardness to new levels but allows Jughead to shine. Ryan North produces a deceptively smart script that mixes broad humor with an underlying heart that creates pathos for poor Jughead. His discomfort with the smitten Sabrina involves a lot of over-the-top distractions he throws her way making a hilariously awkward situation even more so. There's a subtext though borne from Jughead's asexuality that left me a little sad as he's unable to express that to her. Instead, he does everything he can to not reciprocate her affection. The ensuing magical attempts to pay back Jughead for an awful date by Sabrina takes a welcomed turn. North slyly exposes Jughead's many layers that reveal there's more to his hamburger-craving slacker exterior. Derek Charm may understand Jughead even better than North. It seems like artist and subject are one because each expression, each exaggerated gyration, or thoughtful look is conveyed with humor but also capable of pathos too. If there's anything like perfect comedic timing in sequential art, Charm has it. The sequence of events following Jughead's date with Sabrina is so well executed and surprisingly fun that it makes this issue irresistible. 'Jughead' is one of those comics that can change your mood. If you're having a bad day, this comic will put a smile on your face. It's classically funny with a contemporary approach that's more nuanced than you'd expect. North adds layers of depth to Jughead that makes him even more endearing than he already is. The inclusion of Sabrina and Salem are welcome great guest stars that bring their own sense of magic both figuratively and literally. The bottom line is 'Jughead' is can't-miss entertainment.